How about the Erie Canal? 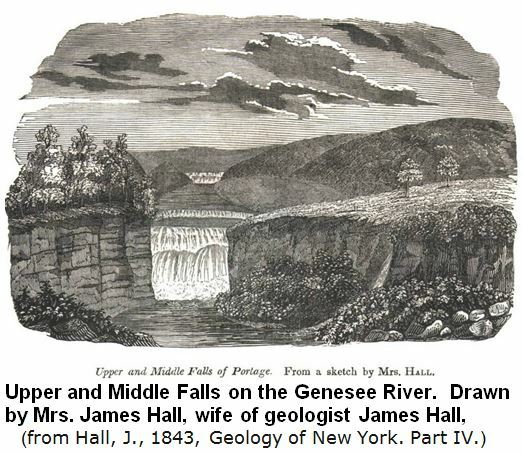 From May until November, the Rochester shale is submerged along the banks of the Erie Canal while the canal serves as a commercial and tourist waterway. 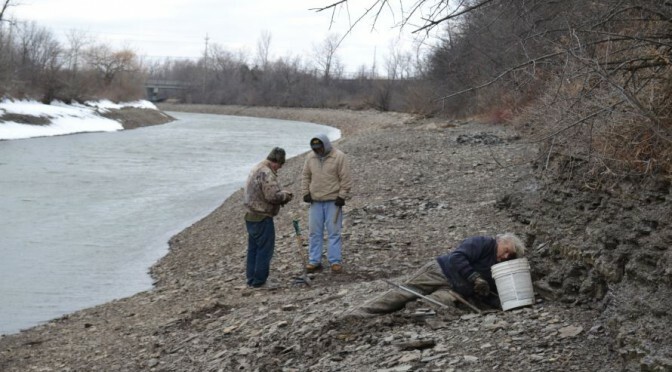 From December until February snow and ice typically cover any rock cropping out along its winding shorelines through Rochester after the New York State Canal Corporation drops the water level for the winter. That pretty much leaves March for fossil enthusiasts to brace the late winter weather to seek trilobite and brachiopod treasures in the exposures afforded by the man-made waterway. And that is just what several members of the WCGMC did on March 22nd. With temperatures just a touch above freezing and cold NW winds blowing along the canal, Gary Thomas, Scott Jones, Jerry Donahue and Fred Haynes put on their woolies and tramped along the north side of the Canal to the Rochester shale outcrops just east of Long Pond Road. The search for Dalmanites and Trimerus trilobites was partly successful: both were found, but only as parts! 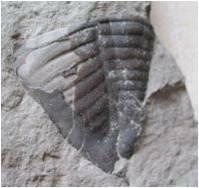 Complete trilobites are, of course, rare due to the fact that trilobites are anthrapods and molt their exoskeletons. Thus, most parts are actually molts. 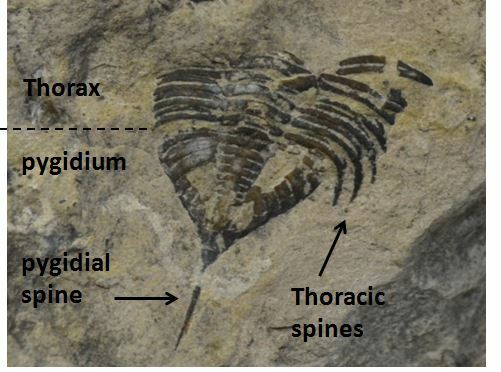 Gary located a nice Trimerus pygidium and partial thorax, but no cephalon (head), similar to the one pictured in the photo collage on the next page. A few Dalmanites pygidiums were found also, but again the heads were not preserved. One such specimen I found is pictured below. A well preserved Dalmanites limulurus molt from the Long Pond Rd. Erie Canal site. 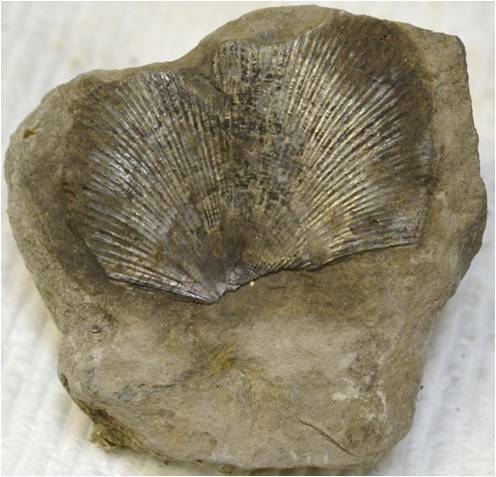 Below is the pygidium of a Trimerus delphinocephalus, also from the Rochester Shale. Several nice brachiopods were found, including a number of complete Strophemenids which are likely Coolina subplana. The Strophemenid Order of brachiopods are flat, exhibit very straight hinge lines and show strong radiating placations (ridges). They exhibit a bit of a silvery sheen (see photo on page 1). It is disappointing that this location disappears below canal level when the collecting conditions are a bit more tolerable. Strophemenid brachiopod (Coolina subplana) collected on March 22nd, 2014 along the Erie Canal. Brett, C.E., et. al.,1994, Ordovician and Silurian Strata in the Genesee Valley Area Sequences, Cycles and Facies, in NYSGA Field Trip Guidebook for 66th Ann. Mtg., p. 381-442. Grasso, T.X., and Liebe, R.M., 1994, Geology of the Erie Canal: Rochester Gorge and Eastern Monroe County, NY, in NYSGA Field Trip Guidebook for 66th Ann. Mtg., p. 129-220. Want to read more: visit (http://research.amnh.org/paleontology/trilobite-website/featured-trilobite-locality/description-rochester-shale-locality) for an interesting discussion about a privately owned exposure of Rochester shale in Middleport, NY called Caleb’s Quarry where the Middle Silurian suite of trilobites and other invertebrates have been found.